Me and a friend dropped into Bikanerwala wanting to have a light meal. Instead of walking up to the restaurant on the first floor, we decided to order at the food-court. I’ve never enjoyed the ambiance in the food-court section here, for it’s always crowded, and therefore, loud. My friend ordered Dahi Puri, while I opted for the North Indian Thali. The food was ready soon, and we were busy hogging. 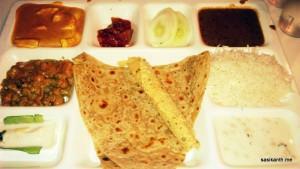 Th thali came with a Paratha, Mixed Vegetable Curry, Paneer Butter Masala, Dal Makhni, Rice, Boondi Raitha and a sweet. On first sight, the quantity looked less, and I was apprehensive if this would fill my tummy. The Mixed Vegetable Curry was perfectly cooked and was one of the best I’ve had. The PBM was creamy and perfect. As expected, the paneer was fresh and melt in my mouth. The dal had too much masala, but was yum. All of them were made with shuddh ghee, and I could taste it in every bite. The parata was also baked in ghee, and so turned out to be super heavy. The sweet turned out to be excellent. Overall, an excellent meal. What I thought wouldn’t fill my tummy actually got me stuffed thanks to the ghee used. However, at 300 bucks, I think it’s quite an expensive affair. PS: Kailash Parbat has similar thali priced lower, with more quantity.